A law firm has filed a class action lawsuit on behalf of owners or lessees of vehicles equipped with an aerial device or aerial work platform manufactured by Terex Corporation. 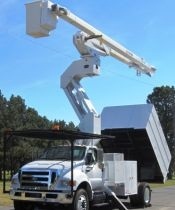 The complaint, filed by Beasley, Allen, Crow, Methvin, Portis, and Miles, P.C., on behalf of plaintiff Ace Tree Surgery, Inc., alleges the aerial platform — often mounted onto commercial truck chassis and sometimes referred to as a cherry picker or bucket truck — is defectively designed. The complaint alleges a particular brand and model line of Terex Hi-Ranger XT Series does not meet the standard for aerial devices, which could result in catastrophic failure resulting in serious injury or death to users and bystanders resulting from falls and impact with equipment. The lawsuit asserts Terex was aware its product did not meet legally required safety minimums but falsely claimed the product met all standards and sold the product as such. The American National Standards Institute (ANSI) dictates that vehicle mounted elevating and rotating work platforms meet a structural design requirement that design stress is not more than 50% of the minimum yield strength of the steel, or a two-to-one safety factor. The minimum yield strength is the amount of force that must be applied to permanently deform the steel. If the platform does not meet this requirement, the steel may deform and fail, leading to worker and equipment falls with catastrophic results. The plaintiff, individually and on behalf of other members of the class, seeks economic damages for replacement of the Hi-Ranger XT, damage to vehicles on which the Hi-Ranger XT are mounted, and injunctive relief. The complaint was filed in the U.S. District Court for the District of Connecticut.